Planning the ultimate she shed and think you might want a bit more room than typically found in a shed? Why not convert a garage into a she shed, instead? Think of the possibilities! 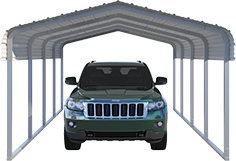 A VersaTube Garage is the perfect starting point. 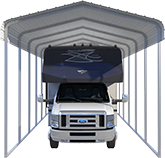 Our standard garage models come with both frame and steel siding, and you can choose from an array of colors for your siding and roof. But, if you want a different look, you could choose a frame only, and then add the siding of your choice. Insulation - protection from condensation, summer sun or freezing winter temperatures is a must. Electricity - unless you’re going for a silent, zen meditation room, you’ll almost certainly want to have electric run. Lighting - you can go for simple lamps that plug into outlets, recessed lighting, or an ornate chandelier. It’s completely up to you and your style. Plumbing - while you might not need plumbing, if your she shed is going to be a potting shed, greenhouse, or any number of other ideas, you might want to go for plumbing. Finish the walls - simple drywall or plywood works for any she shed, or you can use this as a chance to set the vibe by leaving some metal exposed for a modern, industrial feel. Update the floors - you don’t have to leave the concrete foundation as your floor. Tile over it, add hardwoods or laminate, or go for soft, cushy carpet. Artist studio - you won’t have to worry about putting away all the messy (or toxic) materials, or stashing wet canvases because all the kiddos in the house know they aren’t allowed in Mom’s studio. Library - fill the walls with bookcases, set up a cozy seating area, and add a writing desk if you want. You’ll love that it’s such a quiet, peaceful place to steal away to and read a book, without the noise from televisions and video games. Yoga studio - add soft lights, your favorite centering music, and a thick yoga mat for a blissful retreat. Home spa - set up a massage table, install a soaking tub, or go all out with a home sauna. Game room - game table, billiards table, or comfy recliners and a big screen TV, he might think you’re building him a man cave, but weekly game nights with your friends sounds like the perfect mom’s night out! 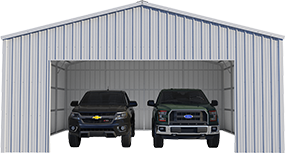 Whatever the elements of your ideal she shed, you can make it happen with a steel garage from VersaTube! Got a specific idea in mind? Contact one of our design specialists to discuss your ideas.